Idle is around 32W and maximum power consumption hits just under 88W in our test bed. The solid part about the Intel Core i3-8100 is that it is able to power machines at under 1A in 110V or 120V racks. For the low-cost colocation world, this is a great option. We expected, based on TDP, that the Intel Core i3-8100 would run warmer than the Core i3-8300, but that was an incorrect expectation. TDP does not equal power consumption. Note these results were taken using a 208V Schneider Electric / APC PDU at 17.7C and 72% RH. Our testing window shown here had a +/- 0.3C and +/- 2% RH variance. At under $117, and a socketed alternative to the Intel Xeon E-2100 series, this is actually a great CPU. 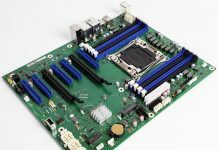 One can access the server and workstation Intel Xeon E-2100 series platforms, but with a low-cost chip. One also gets four full cores instead of two cores and two hyper-threads which is a major performance bump over generations ago. The Intel Xeon D-2100 series still has some major advantages. The Intel Xeon D-2100 series can utilize higher capacity RDIMMs, has more memory bandwidth, and has 10GbE NICs built-in. It is hard to discount that value. The same comparison would likely apply to the Intel Xeon Scalable family where one gets more clock speed with the Intel Core i3-8100 but misses on the platform benefits. 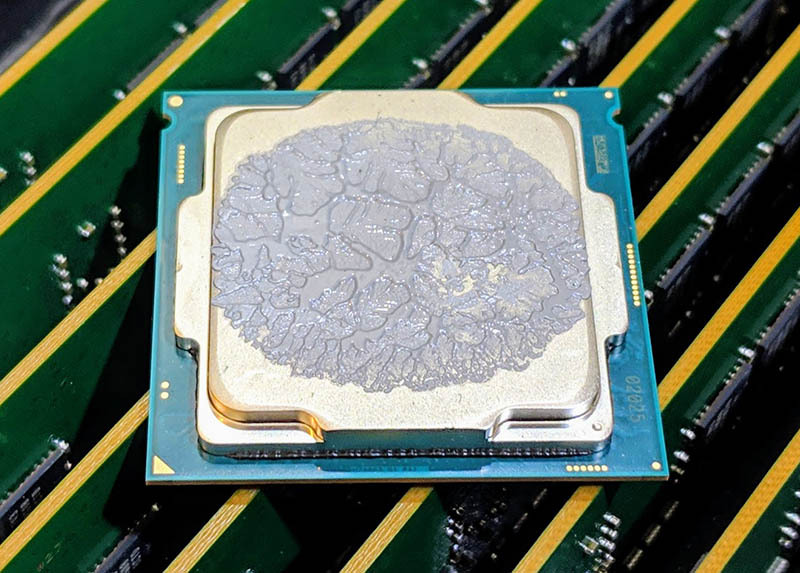 Compared to the Intel Atom C3000 series, the Intel Core i3-8100 does not have all of the same platform features but is much faster in single-threaded workloads. The larger and more robust compute cores (as seen in our GROMACS test for example), and higher frequencies make this an option for sub 120W operation 1U servers. The decision tree branch that will lead you to the Intel Core i3-8100 over Atom and Intel Xeon D siblings is the Intel iGPU. The iGPU is not the focus of our CPU benchmark suite, but it includes transcoding hardware support that may be of interest to some deployments with supporting software. One can use BMC graphics for day-to-day management and offload transcoding to dedicated hardware logic not present in mainstream Intel Xeon CPUs outside of the Xeon E-2100 line. If your application can utilize video features or even transcoding offload for Quick Sync video, then the Intel Core i3-8100 is the option to choose. At the time of this writing, AMD EPYC does not have a real competitor to the Intel Core i3-8100 for servers. One can use an AMD Ryzen but until we see platforms like the Tyan Tomcat EX S8015 hit the market, and from multiple vendors, AMD’s superior compute performance with Ryzen is lost by not having platforms with features like IPMI. If someone wanted to use a consumer platform without management, then Ryzen is an option, but the market for that is very small. A year and a half into the Ryzen adventure, the ecosystem is still not picking up the slack. This is a CPU that sits near the bottom of most of our charts. It is also a CPU that is only $117, or less than most motherboards, sticks of ECC memory, network cards, drives, and even the chassis one would use with the CPU for a server. There are cases where you simply want a server that does not use an enormous amount of power and can fit in a smaller footprint while still using ECC RAM. In those cases, the Intel Core i3-8100 is a perfect match. Where it gets harder to recommend the Core i3-8100 is when you need more. If you need more clock speed, the Intel Xeon E-2100 series is faster. If you need more memory, PCIe or networking, the Intel Xeon D-2100 or Xeon Scalable servers offer more, and even the Atom C3000 in many cases. Once you virtualize, it is easy to save on a TCO basis with one larger system. Compared to the previous dual-core, quad-thread Intel Core i3 CPUs, we like this direction. The bump to four cores, four threads is being driven by the AMD Ryzen threat on the desktop, but AMD Ryzen still does not compete directly in the server market. One can also look at this low-cost chip as a plug. Buy a low-cost Core i3-8100 today which is readily available from shops like Amazon, then upgrade to a 6-core or potentially 8-core Xeon E-2100 series CPU if and when they become available at a reasonable upgrade price.